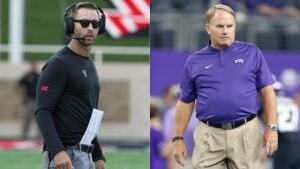 FORT WORTH, Texas — TCU defensive guru Gary Patterson and Texas Tech offensive mastermind Kliff Kingsbury both express admiration for how the other coach excels at his specialty. “Coach Kingsbury is probably one of the brightest offensive minds in college football, and really anywhere,” Patterson said. The two head coaches will be on opposite sides of the field Thursday night when Texas Tech (3-2, 1-1 Big 12), with the nation’s top-ranked offense at 591 yards and 48 points a game, plays at TCU (3-2, 1-1). The Horned Frogs have the Big 12’s best defense. It was unclear who will take the snaps, with both teams playing for the first time in 12 days. Both starting quarterbacks got hurt when they last played Sept. 29. TCU quarterback Shawn Robinson was helped off the field and to the locker room in the final minute of TCU’s game against Iowa State after taking a hit to his left (non-throwing) shoulder. Red Raiders true freshman Alan Bowman was the nation’s top passer before a crushing blow against West Virginia left him with a partially collapsed lung and led to a short hospital stay. Bowman has already returned to practice and Kingsbury said he could be available to play, along with junior McLane Carter, whose high left ankle sprain in the first quarter of the season opener set up Bowman’s early debut. They also have dual-threat player Jett Duffey. The Horned Frogs have allowed only 304 yards and 21 points a game this season. They held Texas Tech to three points last year. Under the lights, weeknight edition. Patterson promised this week that Robinson, whose first start was a 27-3 victory as a freshman at Texas Tech last November, will play. But the coach was talking even before that injury about backup and former Penn transfer Michael Collins being more involved. “We’re going to have plans for both guys. Shawn is a tremendous athlete. The other kid, we haven’t seen a ton of, but it sounds like he’s a very talented player as well,” said Kingsbury, expecting TCU offensive coordinator Sonny Cumbie, like him a former Red Raiders quarterback, to have both ready to play. The Red Raiders are 2-1 in Fort Worth since TCU joined them in the Big 12. Both of those were extended wins: 27-24 in double overtime two years ago, and 56-53 in three overtimes in 2012. The Frogs won 82-27 at home in 2014, then a year later in Lubbock won 55-52 on a fourth-down catch of a tipped pass in the back of the end zone in the final minute. One concern for Patterson is the extra time Kingsbury had to add something to the playbook. While anxious to get back on the field after a loss in their last game, Kingsbury felt the break came a good time for the Red Raiders. Texas Tech junior receiver Antoine Wesley is second nationally at 124.2 yards receiving per game. He had only 12 catches for 146 yards in his first two seasons. … TCU has an eight-game home winning streak. … The Saddle Trophy was reinstated for the series last year after a replica was created. The original trophy was lost after the teams had played for it from 1961-70.